Highly recommend Dr. Nadji. He was excellent and explained everything in detail. Thanks for a great experience. Great doctor who is fast, courteous, thorough, and really takes the time to understand your unique eye health situation. 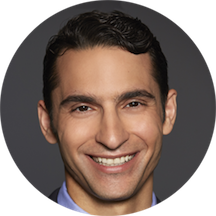 Dr. Nadji is a fellowship trained board certified ophthalmologist. He takes pride in seeing his patients in an efficient manner and always gives them the chance to ask any and all of their questions. He specializes in suture-less cataract surgery and is one of the few surgeons in Santa Monica performing the newest laser cataract surgery. He is available for ophthalmic consultation and can screen for glaucoma, dry eyes, macular degeneration, cataracts, keratoconus, and diabetes. Dr. Nadji graduated from the University of Texas at Austin and attended medical school at the University of Texas Southwestern. He then moved to New York to complete his residency at Nassau University Medical Center and his cornea fellowship at Ophthalmic Consultants of Long Island under the mentorship of Dr. Henry Perry and Dr. Eric Donennfeld, two leaders in the field. In fellowship, Dr. Nadji specialized in advanced cataract surgery, premium intraocular lenses, cornea transplants, and the latest techniques in laser and refractive surgery. In his free time, Dr. Nadji can be found playing sports and enjoying the weather with his wife and baby girl. He would be humbled for the opportunity to be a part of the care of your eyes. Nissirios N, Barsam A, Nadji E, Donnenfeld ED, Perry HD. Relationship of Bell’s Phenomenon with Salzmann’s Nodular Degeneration. Cornea. 2013; 32:939-42. Arciniega JC, Nadji EJ, Butovich IA. Effects of free fatty acids on meibomian lipid films. Exp Eye Res. 2011; 93:452-9. Very professional approach, fast and very informative info on the insurance coverage. I liked the modern equipment they have plus the contact lenses trials I've got to test out. Thank you! I've found my new eye doctor. A friendly, fast, thorough visit! Don't really have enough good things to say about this experience. I was seen immediately (which has literally never happened to me before with a doctor). The team was lovely to interact with, and they went through an incredibly thorough assessment.Dr. Nadji was warm, listened to all the questions and symptoms I had, and never made me feel like I was going on too long or was being silly about what I was noticing. He reviewed everything I had said and addressed each point through the tests he ran and his observations. He was incredibly caring in the way he interacted with me, and gave me some recommendations with degrees of how important he felt they were. This was truly the best eye appointment I have ever experienced. Great visit, nice Dr, modern technology, expensive parking. The office was busy during my appointment, but they gave me the impression that wasn't normal. Once I was called, visit was quick. Dr.N humored me and listened to my concerns. Was superhonest and walked me through the why, without taking forever. Parking was $2 per 15 min. I probably could have ubered for less. Very thorough and professional. I would highly recommend. He and his assistants were very friendly and professional. I really liked Dr. Nadji but the wait time was crazy long, I sat there for almost 40 minutes waiting to see him. Dr. Nadji is very knowledgeable as well as efficient. I was in and out very quickly, and I felt very comfortable with his assessment. The staff was very friendly and answered all my questions with enthusiasm. I highly recommend his service! Very attentive, understood my concerns about my eyes within minutes of meeting him for the first time. Very knowledgable and up to date about the newest methods for dealing with the concerns that I had. Totally positive, professional experience! Thank you! Very efficient, thorough, and good bedside manner. Dr Nadji is an excellent doctor. He is very thorough and caring with a wondeful bedside manner. He takes the time to answer all your questions in great depth. I highly recommend Dr Nadji. By far one of the most kind and understanding medical professional I have ever been helped by. You can tell he genuinely cares about people. Thank you doctor Nadji!! This was my first time seeing Dr. Nadji and I was very impressed. It’s obvious he really cares about his patients. Dr. Nadji was extremely professional, kind, and knowledgeable. He immediately knew what was going on and was very attentive to my symptoms. The office visit was incredibly efficient as well. I was a first patient and they took me in rightat my appointment time, I was in and out within 25 minutes. Definitely recommended!! I've had ~5 different ophthalmologists over the years as I move around, and Dr. Nadji is definitely my favorite. Great equipment, perfect balance of thorough yet quick, friendly and knowledgeable, and I get the sense he really has my best interests in mind. Highly recommend. Dr. Nadji is amazing, super smart and kind. Best eye doctor ever!!! Dr was super nice and very knowledgeable! I had a wonderful experience seeing Dr. Nadji. His staff was really friendly and super efficient. The consultation was thorough and I left feeling really great about it! Very professional, considerate of your time, and competent. So professional & awesome. Staff was so helpful! Felt like I needed night-time driving glass so went in for a prescription. My appointment was quick and easy! They did some tests and everything went smoothly so I was in and out of there. Highly recommend! Dr. Nadji and his staff were all warm and accommodating. I arrived a bit early and was seen within ten minutes or less. The technology was high tech, and their selection of glasses was enough for me to find a cute pair. He's simply wonderful! Plus his staff were also great! Lovely bedside manner and he answered all of my questions while talking me through everything he was doing and checking for. He even made a follow up call the next day toask how I was feeling and make sure I was healing. I don't know if what he recommended works yet, as I just saw him this afternoom, but he was very knowledgeable, explanatory, and friendly. Also he had me in and out of there in a flash. A+++++ Doctor man. Could not have had a happier more quicker visit. I already recommended Dr. Nadji to two people before I even got home from the appointment. He was very thorough in a non-condescending way and he and the staff were someof the nicest I have encountered in a doctors office. Thank you! Great caring Doctor for the short amount of time he saw me. My appointment had a long wait (>30 minutes) and i was shuffuled back and forth from the dianostic room to the lobby three times. I felt that the doctorjuggles mutiple patients at the same time so i felt quite rushed. Would appreciate better appointment management. I've been seeing Dr. Nadji for a couple of years, and before that I brought my mother to see him. She adores him too! Dr. Nadji is highly professional and competent and also a warm individual who seems to care abouthis patients. I look forward to my visits. I also really like the young lady who does the measurements/tests. Sorry I didn't get her name. This visit was the first appointment after lunch which explains why I was seen right away. But normally there's not much of a wait. Great doctor, personable and friendly, got straight to the point with my treatment. Found an appointment right away. Office very easy to find. Wait very minimal. Dr. Nadji diagnosed my minor issue right away and was very hospitable and thorough - I even left with a few free samples. Also, the pharmacy downstairs is convenient and incredibly fast. Dr. Nadji and his staff were great. They were efficient, educational and very friendly. I was surprised that he did not try to "upset" me on more frequent visits or any other the things that doctors often do. I would definitely recommend! It was one of the best doctor visits that I have ever experienced. Everyone was personable, but professional; technology was cutting-edge, but appropriate; and the entire visit was efficiently realistic, but upbeat. I'm actually looking forward to going back to pick-up my glasses! I was very impressed. Dr Nadji appeared thorough and spent a substantial amount of time checking various aspects of my eyes. I did not feel rushed when describing my problem. Over all, I thought he did a very good job. Dr. Nadji exemplifies what all doctors should strive for. He is a professional above all else, knowledgable, dedicated, he takes his time and is not rushed, he answers your questions and concerns, and he wants the best for his patients. Icame away wishing all specialists had his skills and shared his concerns. Bravo Dr. Nadji, i was lucky to have found you on Zocdoc. Your office staff is great too! Thanks. Dr. Nadi is friendly and professional and explains each step of the procedure. He inspires confidence and puts the patient at ease. Can't say enough good about him! Very professional and friendly. Quick with diagnosis and treatment, great visit!